Oh Im late today courtesy of too much partying last night..fun though! No ones home this morning except me and my sore head so I had to get creative on who drew out the name from the bowl. Bella got a leftover bit of roast lamb for her help.. Bella is currently on Chemotherapy for Tcell Lymphoma. We have managed to halt the disease for over 6 months so far so fingers crossed we will have more time with her. 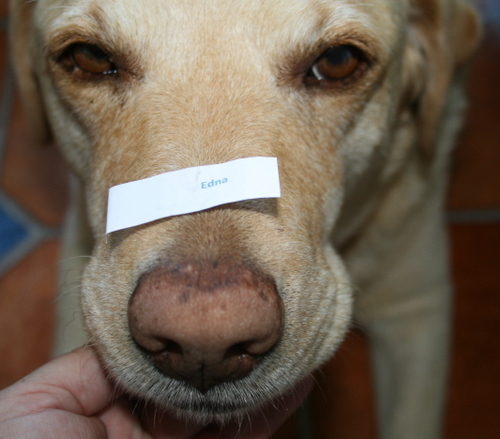 …and so the winner of yesterdays bag is..
Congrats Edna! Ill drop that off to you sometime this week. The other prize draws are ready to be posted today too. and here is Day fours giveaway. A large bag chocka with scrapbooking supplies and stamps suited for scrapbooking. Have a lovely crafty day. I have some Design team work to do today. Another wonderful dog Delys, love the name, I had as I grew up German Shepard name Bella was always my favoite dog name. Best of luck with her therpy. Best wishes for beautiful Bellas treatment! Thank you for sharing your amazing projects throughout the past year, I can’t wait for next year. A girl always loves more scrapbooking things. I really must make it one of my new year resolutions to do more pages and catch up on the kids scrapbooks. Aww what a cute photo of Bella! As for the giveaway, who doesnt love surprises! shhhhhhhh sneaking on here from work LOL, beautiful fur baby. thats a very HAPPY bag, Delys!! Mum didnt get outa bed till 10ish … she hasnt been to the pools either. She is on the couch drinking water … I guess we wont get down to the river today with her being in that condition. All the very best for Bella’s treatment and may you see many, many more days with her. Hopefully your day has been great. Looks like another great package of stuff you are giving away today. Love the bag, Love the phot of Bella.So great to spend time with friends, love this time of the year. 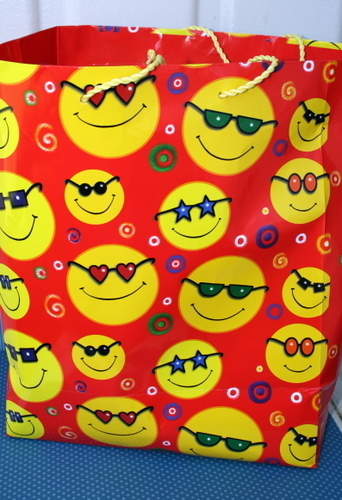 Cool bag – am sure it contains cool goodies. Thanks for the chance. Hope everything goes well for Bella. Thank you for your giveaways that look amazing. Buster says go Bella you can woof it. Love that bag, Hope the head feels better soon, Have a great New Years. Trying to get assignment done so I can do some scrapping. HAPPY NEW YEAR EVERY ONE HAVE A GOOD ONE. Bella is gorgeous and it appears very good at picking names out of the hat. I hope she continues to get better with her treatment. ooo, look at those puppy dog eyes. gotta love her! Yes I have a sore head but I think it is due to working late last night. Wish is was from a party though. Hard to get A into G and get into work today.